I’m primarily a conservationist, mostly on a voluntary basis, occasionally working through governments in the field of heritage conservation – for instance, looking at heritage values at Wilsons Promontory National Park and West MacDonnell NP in the NT. I also work as a lecturer, guide and advisor for a World Wide Learning programme. Partly this involves taking American students twice a year on a tour of Western Tasmania where I introduce them to the landscape and the environmental struggles. I have a gardening business, called Plenty Hills Garden Maintenance, with my wife. We look after people’s gardens. why did you move where you live – what drew you to the place? I live in the Nillumbik Green Wedge. From here we look out to the Kinglake Range. We are working hard to protect the green wedge out here, and I am involved in an advisory group that has been going for 4 years. We have been developing a management plan for our Wedge (one of 12 around Melbourne). The prospect for the wedges is not good. There is for instance the Frankston Bypass, that will go right down the peninsula through the Mornington Green Wedge. I have been involved with the Green Wedges since the 1970s, attempting to get protection for the green lungs of Melbourne. I was involved in the 1970s and 1980s in attempting to get protection for the Yarra Valley for, creating reserves from Templestowe through to South Bank. We fought many developments and won most of them – from football fields, and housing developments and all the rest. The way forward was to get these areas protected in metropolitan parks. The Yarra Valley has been reasonably well protected as a result of these campaigns. Various stages of the campaigns have been fought for years. For instance, there was a proposed feeder into the Eastern Freeway through Warringal. This was defeated but has now been revived. The Hamer government (Liberal, in power from 1972 – 1981) was quite conservation oriented and gave us many of our victories. This is completely unlike the situation with Labor today. Having a conservation minded premier makes all the difference. He was always open to hearing about environmental issues. But we know who really runs the state today– the current government are really just lackeys for big business. I arrived in Australia in 1960, and lived initially in Canberra. I spent three years doing research on Tasmania, and spent half my time down there. During that time, I joined the Hobart Walking Club (HWC). Inspired by the HWC, in 1961 I founded the Canberra Bushwalking Club (CBC) and started to get out into the high country nearby. I had learnt a lot about national parks in Tasmania and previously living in Canada and New Zealand, and we got involved in the move to create a national park in the ACT (in about 1962). We worked on this with the very young National Parks Association (NPA) in the ACT which had been created a few years before. The NPA was very conscious aware of the situation down in Kosciusko, which at that point was a State Park, where a range of unacceptable land uses were allowed, including grazing and logging. Wary about this model being applied to an ACT park the NPA proposed a small but ‘pure’ park proposal. The CBC thought that things were changing and we needed to think bigger – we proposed a much larger park. This became the Gudgenby Park and eventually the Namadgi Park. Another key involvement was to develop a management plan for the Kosciusko State Park. This involved action on two fronts – zoning of land use, and protection of wilderness areas. I worked on the management plan for the Park and was able to push for management planning that included zoning (with different types of activity allowed in different zones) and for wilderness to be one of the zones. We drew on the work that had been done in the USA around protection of wilderness and by Myles Dunphy in the 1930s and 1940s. We managed to get the first wilderness zones declared in Australia – at Kosciusko and Kinchega near Broken Hill. This was in 1966-1967. In 1965 I had moved to Newcastle and had there continued my research into NSW parks and wilderness. This background allowed me to influence the work being done in NSW around wilderness and park management in the late 1960s. Tom Lewis, who went on to be premier in 1975 and 1976, had a great experience of the modern approach to parks that was happening at the time in the USA. He brought this approach back with him and worked on legislation to modernise the system here and I was able to help ensure that wilderness got included in 1967 NSW National Parks Act. Who has had the greatest impact on you as a person? One very influential person who I discovered through my NSW research was Myles Dunphy. He had been working away at developing systems of national parks in NSW since about 1915. What was so significant about his work was his big vision approach. He sketched out what was required rather than just asking for what might be possible. He was also an excellent cartographer. He drew up visionary plans for new parks in the Greater Blue Mountains and the Alps. He also advocated the development of a wilderness system. I took this approach to the Alps, looking at a large park that would cover the entire alps, from the ACT right down to Baw Baw. It was Myles who stressed the need not to compromise on your ideas and aims. He was incredibly determined. Myles idea for a big two state alpine park had been rejected by the Victorian government, so his effort became concentrated on a Kosciusko National Park. To my mind we needed a park that extended right down the range. But by the late 1960s it was not a widely held idea. I remember ringing Ros Garnet, who was then at the Victorian National Parks Association (VNPA), to ask about the efforts for an alpine park in Victoria and the prospects of getting a large park over both states. He was flabbergasted that someone in Canberra was interested in what was happening in Victoria. 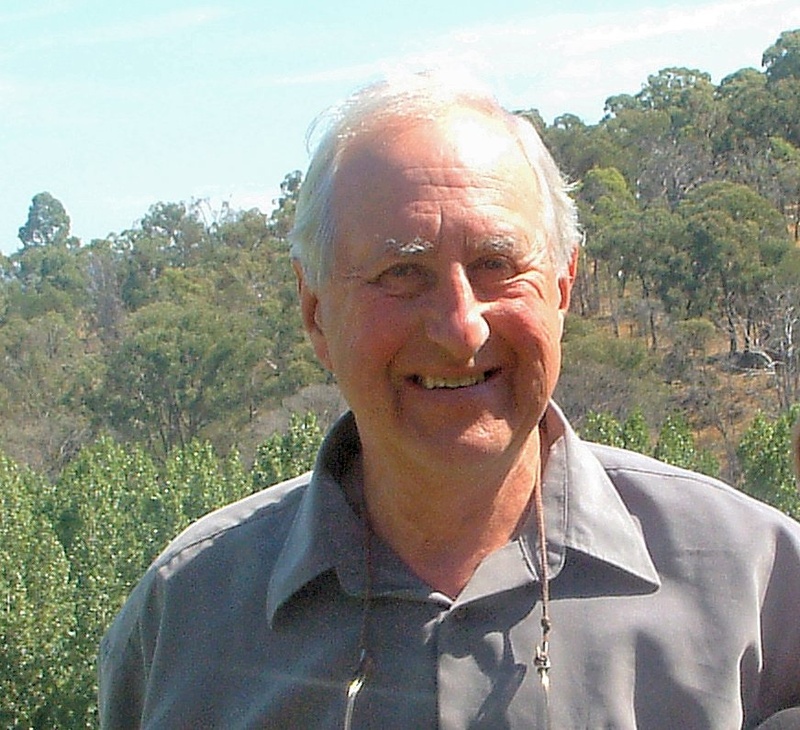 In 1968 I joined the Australian Conservation Foundation (ACF) as its Assistant Director and moved to Melbourne in 1969. In that year I wrote the ACF’s High Country Viewpoint, with assistance from a range of people. This included the proposal for a park stretching right across the Alps and a walking track through it and helped reset this vision into the broader public agenda. The other person who greatly influenced me was G H B Ward. I met him through my research into the Peak District National Park in the early 1950s. I was born and bred in the Peak. It was England’s first national park. He was the secretary of the Clarion Ramblers based in Sheffield. He was an indefatigable advocate for public access to the moors. He was involved in trespasses on the eastern side of the mountains in the Peak District to force the creation of pathways for ramblers. He used to write an annual publication for the Ramblers. They are a wonderful mix of history, botany and notes for walkers. This is the sort of country I grew up in. That’s where I developed my love for nature. The Moors, the Dales, the mountains and the grand plateaus like Kinder Scout. Another place that inspired me was Robin Hood’s Stride, two tors or pillars of gritstone near my home. The idea was that Robin would have strode between the pillars. I grew up in a village between two Dales, this was where we played as kids. Growing up in a place like this influenced me for the rest of my life. It has been – and continues to be – to gain protection of nature and to see the creation of a reserve system that will adequately protect our wild places and using that inspiration to work for the replacement of economic growth by a steady state economy – across the world. I moved down to Victoria in 1969 to work out of the Melbourne office of the ACF and started to encourage the organisation to work more strongly on the greater alpine park proposal. We had great victories over the next twenty years and saw the creation of the many of the parks that now exist in the alpine region. See here for a timeline of some of the milestones in this campaign. There is still a major gap in the southern end of the Park, from Mt Macdonald to Baw Baw. I have proposed a new section to fill that 80 kilometre gap (see map at side). I have nominated that area for the National Heritage List. To my mind it’s a ‘no brainer’ – it would include Mt Skene, Mt Useful and the McAlister Gorge. These areas were recommended for reservation by the Land Conservation Council (an advisory body to the state government) in the early 1980’s but they have still not been gazetted. 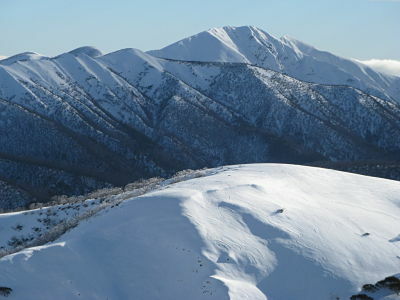 In the mid 1970s the idea of an alpine park extending all the way south to Baw Baw was backed by the ACF, the Victorian National Parks Association and the Australian Academy of Science. It would be great if these bodies would step up back up to the mark. See here for more details on the proposal. One way forward towards a single park was though coordination of management . In 1983, I was able to take a group of Victorian MPs including Rod McKenzie, the environment minister, to Kosciusko National Park to look at the areas where grazing had been removed since 1969 . The then environment minister for NSW came up to join the Victorians. The great improvement in thinking at this get together was obvious. The idea of joint management of the parks across the state boundaries came up. It was agreed on the last day of the visit that New South Wales and Victoria would work towards reaching a joint management arrangement – a formal agreement. Instead what we got three years later was a Memorandum of Understanding to cover coordination of management and from this came the Alps Liaison Committee, which continues until today. The only problem with that was that since then (the mid 1980s) we have not been able to include large areas of the forests to the south in this joint park system. The arrangement only covered the Alpine parks. During the 1970s we started to work extensively on the reserve agenda for the forests of East Gippsland. In the early 1970s we had been successful in defeating a proposal for a road along the coast from Marlo to Mallacoota. We then proposed a large vision for a major park in East Gippsland, however the VNPA had gone for a much more modest proposal. What we actually got was a mix between the two visions. In the early 1990s I worked on a report on world heritage values for the forests over the border in south eastern NSW and the bringing together of several parks into one. I had begun work on gaining new parks in this area in the late 1960s when, as a member of the NSW Scientific Committee on Parks and Reserves, Alec Costin and I had recommended a series of parks in an area about to be threatened by the woodchip industry. 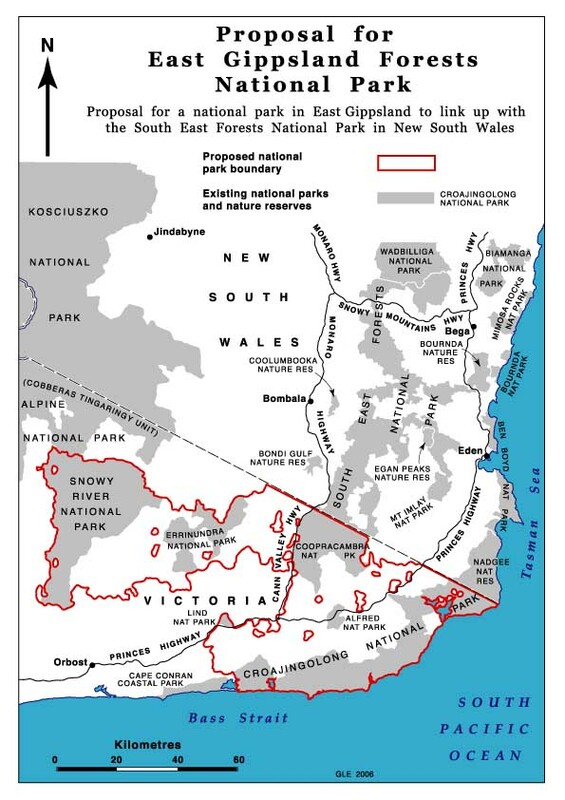 In the late 1990s Bob Carr finally joined most of these parks together to form the South East Forests National Park. We had the idea of developing an ‘alps and forest’ world heritage area. The breakthrough came nationally in July 1989 with Bob Hawke’s statement on the future of conservation in Australia. He said that these areas would be assessed against World Heritage criteria. A series of reports was done but the Alpine Liaison Committee was in charge and as a result some of the studies were limited to the alps section of the region. For instance Jamie Kirkpatrick’s report was limited in the geographic scope he was allowed to cover. The reports on the natural values of the region were completed by about 1992, and they all showed that the values were of a world heritage significance. But then we were subsumed into the Comprehensive Regional Assessment (CRA), which was intended to provide the framework for regional forest agreements. Again, the World Heritage Expert Panel reports identified the existence of world heritage values, and recommended further research, but a decade or more later, very little has actually happened. Now Australia is currently revisiting the requirement to have an inventory of potential World Heritage areas. No areas will be considered by the World Heritage Committee unless they are on that list. So I have been working to get the Alps and Forest proposal onto Australia’s Tentative World Heritage List. Victoria and the ACT are in favour but not NSW. So we are now focussing on Christine Kenneally, the premier of that state. The notion of a single big park in East Gippsland has been slowly moving forward. See here for extra details on the proposal. This is of course, incredibly frustrating because it has taken so many years and we have not yet realised the full vision, but I am a gardener and a teacher and I know that the job is never really done . The protection of the Alps and Forests is an ongoing battle. I have tried to get a similar liaison approach employed in the alps for forests on both sides of the Victorian and NSW borders. This would allow better co-ordination for East Gippsland parks and the South East Forests National Park on a range of issues, such as weed control. One of the things that frustrates me is the slow pace of action by our government. I look at the situation in the UK, where they set up a whole national parks system in under four years. I look at how slow things are here now, the making of reports, conduct of enquiries, etc drag on for years. Only a few people such as myself have an involvement stretching and knowledge of campaigns back over the decades. I have tried to apply their methods of working for the ideal parks to my work for all the different regions I have been involved with– to the Alps, Western Tasmania, the Great Barrier Reef and Antarctica. Through this time I have walked throughout the Alps, from one end to the other. From age four I have taken my children with me. We have walked everywhere – over Mount Bogong and into the Cobberas and in Far East Gippsland. My greatest enjoyment has come from being in the bush with my children. I’m very keen on the benefits of walking especially through wild nature but I have worked to develop walking trails in other places, for instance the Capital City Walking Trail in Melbourne. When I stood for the Australian Democrats in the federal seat of Melbourne for the election in 1990, the walking tracks proposal was part of my campaign for a Ring Park encircling the city. During the campaign I walked the intended route of the track, involving a mad dash across the Tullamarine Freeway because the government had not built a promised pedestrian bridge. I then had to jump the Moonee Ponds Creek (several times for the media). The ALP opposed the Ring Park proposal and the Liberals therefore decided to back it. When the Liberals came to power in the State in 1992 they began to implement it. I also made sure we got that pedestrian bridge across the freeway as part of Westlink (the Conservation Minister at the time (Mark Birrell) was also Minister for Major Projects which helped). As with the Alps, this campaign is on-going and very slow. Just this year we saw the creation of an underpass that is important for the track to operate properly. It had taken six years! A current instance of the need for action by the whole conservation movement is the case of the wilderness zones in the Alpine National Park. Between when the Land Conservation Council (LCC) submitted its proposed recommendations on wilderness (Wilderness Special Investigation) in April 1991 and when it submitted its final recommendations in November, 1991, 33,000 hectares had been sheared off the proposed wilderness zones. The main reason was the clash with grazing licences. At the Viking Razor Wilderness Zone for instance 8,000 hectares was removed for because of the existence of one grazing licence. These licences were all gone by 2006 but will this matter be revisited? Will Victoria match the efforts of New South Wales for its part of the joint Pilot Wilderness? Will the conservation movement become engaged as they were in 1990-91? These are difficult times for the protection of the natural environment. Look at the current proposal to extend the Western Tasmania Wilderness World Heritage Area. It would be increased by around 800,000 hectares, which would protect many of the high value conservation forests that the conservation groups are attempting to save, including the Styx and Upper Florentine and the Tarkine. But it is so hard to get the environment movement to really engage on the campaigns for new parks and park extensions. They fail to see how these would advance their cause. I think that the movement is finding it increasingly hard to see the big picture We are caught in small scale, short term, case by case campaigns, opposing certain land uses and not supporting the long term solutions. We have to be more idealistic in our approach, in spite of the frustrations that come with thinking this way when victories are so hard to get. At present, I am also working on the idea of a steady state economy alternative – advancing the notion of moving beyond economic growth economies. I am an optimist. I still get out walking with my children. You have to be an optimist to keep doing this work. the future of our society and planet? We need a steady state economy. This must work on all levels – from the local to the global. The first step is to persuade society to take this alternative seriously. I have a book on this topic coming out in October 2010 it is called Steady State – Alternative to Endless Economic Growth. Geoff, I’ve just discovered this excellent interview. Hope you can now help the push for the Great Forest National Park. 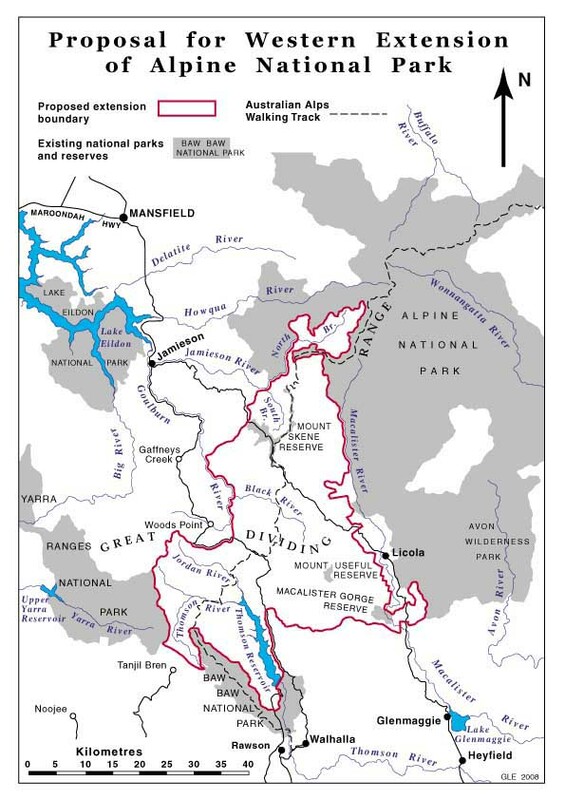 Certainly can but we need to have the eastern boundary link up with the Alpine National Park.